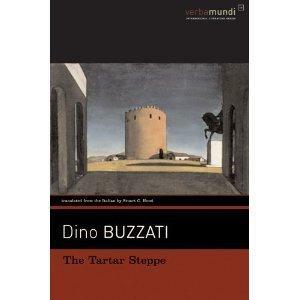 I was trawling through books on the internet when I came across the title The Tartar Steppe. The cover immediately drew my attention, but at the same time the title rang a distant bell. Then after reading the book’s description, I realized why it seemed familiar. Yes! The book was made into a film called Desert of the Tartars, and this was a film I’d enjoyed. While both the film and the book are blistering indictments of militarism, the book has a hypnotic, surreal quality which emphasizes the ephemeral nature of life. He thought of the drab days at the military academy, remembered the bitter evenings spent at his books when he could hear people passing in the streets–people who were free and presumably happy, remembered winter reveilles in the icy barrack rooms heavy with the threat of punishment. He recalled the torture of counting one by one the days to which there seemed to be no end. Drogo says goodbye to his mother and his friend and begins the long journey to Fort Bastiani, located on the Tartar Steppe. It’s here that the novel first begins to show surreal qualities. Drogo’s journey drags on and on, and at several points Drogo imagines that the Fort “couldn’t be much farther,” but of course it is. While on his journey he experiences a “subtle uneasiness,” and he stops and asks people how much further it is to the Fort. One person says the Fort has been closed for years while another directs him farther on. Finally Drogo arrives at the Fort. When Drogo first arrives, he grasps that this is an assignment he doesn’t want, and so he considers leaving. He’s more or less conned into staying, and while he’s told that he may leave, at the same time he’s told it would look better if he stayed for four months. Four months becomes four years and then years become decades…. Fort Bastiani is a peculiar place. It’s the remotest outpost of the Empire and it faces the empty desert. It’s supposed to have a strategic value, and the troops are kept in a state of constant readiness for the long-overdue enemy attack. Passwords are changed daily and strict rules and regulations are adhered to faithfully. These rules–which are supposed to keep everyone ‘safe’ are frequently carried to an illogical extreme. Mindless adherence to rules and regulations even leads to the avoidable death of a soldier, and this meaningless death is later followed by the death of another young officer–one of the few people Drogo has a relationship with. As the young officers mature and then become middle-aged, their hunger grows for conflict. War, after all, will give their lives meaning and prove that their efforts haven’t been futile, but it’s impossible to untangle the myths from the memories, and it seems plausible that legends of mysterious Tartar warriors may have been fabricated over the years. Later the Fort’s strategic value is downgraded, and military life becomes even more absurd. The film Desert of the Tartars has a very concrete presentation of the absurdity, incompetence, and strict hierarchy Drogo encounters, but the book’s surrealism is mostly achieved through the presentation of the passage of time. Staring out at the desolate, shimmering red sands becomes a mesmerizing pastime for Drogo, and militarism creates an alternate reality at the Fort which is achieved through indoctrination. This explains why newcomers see the absurdities of being stationed at the Fort, but then, in time, they begin to believe that there really is a constant threat ‘out there’ that might just sneak up to the Fort at any moment. As the days and the years merge into each other, trivial events are magnified while conversely significant occurrences are trivialized and rewritten to follow the army’s script. The relief of the sentries coming off duty had taken place with meticulous precision under the eyes of Sergeant-Major Tronk, who was an expert on rules and regulations. He had been in the Fort for twenty-two years and now did not stir from it even on leave. There was no one who knew as he did every corner of the fortifications and often the officers came on him by night making a round of inspection, when it was as dark as pitch, without a light of any kind. When he was on duty the sentries did not lay down their rifles even for a second nor lean against the ramparts–they were careful not to stop pacing up and down, for rests were granted only exceptionally; Tronk did not sleep all night, making the rounds with silent tread, causing the sentries to start. “who goes there? Who goes there? they challenged, bringing their guns to their shoulders. Drogo looked at him in amazement and horror. After twenty-two years in the Fort what was left of this soldier? Did Tronk still remember that somewhere there still existed millions of men like himself who were not in uniform? who moved freely about the city and at night could go to bed or to an inn or to the theatre, as they liked? No, you could see at a glance that Tronk had forgotten other men–for him nothing existed but the Fort and its hateful regulations. Tronk had forgotten the sweet sound of girls’ voices, what a garden was like, or a river or any tree but the stunted bushes scattered around the Fort. a world of strangers where his place had been easily filled. He looked at it from without now, looked at it with regret; to go back would have been awkward–new faces, different habits, new jokes, new expressions, to which he was unaccustomed. It was no longer his life, he had taken another path. It would be stupid and pointless to turn back. Drogo waits for his life to have meaning; he waits for something important to happen, and in many ways Drogo’s military life is a highly condensed account of any failed life. For the soldiers who live out their futile lives at the Fort, passwords, rules and regulations provide a veneer of ‘meaning’ that will finally be authenticated when the enemy attacks. The Tartar Steppe was a bit of a depressing read–mainly because I have a difficult time with passive characters who allow life to roll over them (that can be funny but obviously in this novel, there’s no humour). I just kept hoping that Drogo would stop drinking the Kool-Aid, but this is definitely an excellent novel to be read as one of the greats on the subject of militarism. The Tartar Steppe was published in 1945. My version is from Godine Books, and translated by Stuart C. Hood. Just to clear up any point of confusion, on the back cover the main character’s name is Giovanni Drago, but inside the name is Giovanni Drogo. I have read this one a long time ago but I was probably too young to fully appreciate it. The cover is beautiful, I’m not surprised it caught your attention. Reading your review, I understand why the translator of Rilke’s Letters to a Young Poet saw a link between Franz Kappus and Giovanni Drogo. Sounds interesting Guy. I was interested in the fact it was writted in 1945, I was expecting perhaps a communist / left wing slant or allegory but as you comment it’s more of a surreal / existential piece. My appetite for “tough going” novels is a little diminished right now as I’m in the middle of a slog (Something Happened by Joseph Heller) but I’ll remember the title for future reference. I’ve heard of this, and indeed I own a copy of the film though I haven’t watched it yet (my Italian’s grown rusty and it hasn’t got subtitles). Like Leroy it’s going on the watch list rather than the right now list. I need to start the second Proust and I may be moving house soon, so I’m avoiding purchases (though Madame Solario turned up today, my second physical book purchase for September). Still, definitely onto the watch list. There struck me incidentally as being parallels for a lot of futile activities. The current state of Western paranoia even. One watches for a threat, commits resources and eventually the watching becomes self-fulfilling even if the threat seems not to materialise. After a while, we’ve committed so much that to accept there was never much to watch out for becomes unacceptable. Our cost requires a reason, even if it has to be manufactured. Leroy & Max : My copy had no info about the author except for a line or two on the back which included the info about it being published in 1945 “during the fascist regime.” I don’t recall any leftyisms, and it’s a stronger novel as a result. Of course, you can’t escape the fact that Mussolini was running amok at the time, but there’s no intro to hint at Buzzati’s politics. I’ve throughly enjoyed dwelling on the novel in the weeks since its conclusion, and it’s one of those instances when the memory of the novel is better than the actual experience. It’s a wonderful novel, but I wanted Drogo to come out swinging, and he doesn’t. He’s just one man sucked into the vast militaristic machine. Someone could ask ‘what does militarism mean?’ and you could save your breath and hand them this seminal novel. I particularly enjoyed the way Drogo, as a newcomer, sees the Fort for what it is, and then gradually gets sucked into the prevailing mentality. Also interesting are his relationships with fellow soldiers: warnings to leave pop up like the flailing arms of drowning men; they surface and then vanish as the years pass. Yes, there is something to be said for parallels with any futile activity in which we place false meaning, and that’s probably why the novel is ultimately disturbing. Have heard complimentary things about this and other Buzzati titles elsewhere, Guy, so I’m glad to hear you also enjoyed reading it. Hope to go on an Italian reading jag in the next year, so this should help flesh out the more obvious authors/works I’ve yet to get to. Thanks for the detailed post! This is my first Buzzati title. Perhaps if you go on the Italian marathon, you can say how The Tartar Steppe meshes with the rest of this author’s work. Unfortunately the book lacked an introduction and the info about the author (such as it was) was on the back cover. Just finished this title today and was struck by how sad Drogo’s fate made me despite the fact that he had no striking characteristics. Indeed, this is why the book is more of a fable than anything, since no character has any traits particularly noteworthy whatsoever, but rather serve as symbols for hope, rigidity, and youth/old age among other things. My girlfriend suggested that this is to represent the stripped down personality of a soldier, whereas despite their small differences each man is virtually the same person since they are all controlled by the same doctrine. I think it’s a great point, and she hasn’t even read the book! Yes that is a great observation. I think the film version makes him more of an individual–it’s certainly less surreal. The book was actually published in 1939, written in 1938. It was not translated from Italian until after the war as I understand it. A great book,very sad. Eureka! The plot thickens… Found my copy. On the back cover it says “first published in 1945.” Wikipedia says 1940. I have the Godine edition. Thanks, have you seen the film?